The long short squeeze higher in the euro vs usd appears to be finally coming to an end with Friday’s price action hitting a high of USD1.2722 which replicated Thursday’s high, and as a result, created a tweezer top signal. 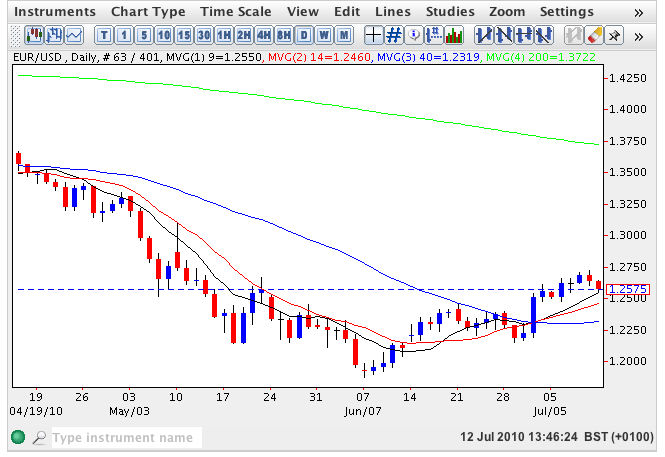 This sign of relative weakness has continued in this morning’s London trading as the euro vs usd probes lower, now testing support on the 9 day moving average, and at time of writing is trading at USD1.2572. Before we can be sure that this present short squeeze has run its course we need to see the pair trading back below USD1.2250 which will then signal a break below all four moving averages once again and as a result confirm the re-establishment of the longer term bearish trend. Provided this occurs then expect to see the euro vs usd break below USD1.1876 in due course and then re-test support in the USD1.1638 region and below. Although you can find this week’s forex trading news for the euro vs usd on my new forex trading site, the most important items include the start of the US earnings season coupled with Thursday’s release from China of its GDP and Cpi figures which will set the tone for trader and investor risk appetite moving forward.